I read this article and found it very interesting, thought it might be something for you. 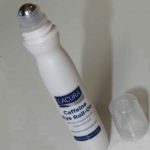 The article is called Lacura Caffeine Eye Roll-On Review and is located at https://homemademasks.net/beauty-blog/makeup-reviews/lacura-caffeine-eye-roll-on-review/. I have only nice things to say about this fantastic under-eye roll on by Lacura – available exclusively from Aldi in the UK. First of all the packaging was the one that caught my attention. It is a cute practical pen looking bottle with a massage ball applicator; it is also travel friendly. I will add that the “caffeine” word used to describe its usage also tempted me. I knew already that caffeine applied locally, has a positive effect on the delicate skin around the eyes. When caffeine is applied to the tissue around the eye area it has a stimulating effect and it helps tighten the skin by reducing capillary permeability (leaky blood micro-vessels). It also increases constriction there by moving the fluid away from the eye area. This effect has been shown to help with puffy bags which are characterized by fluid build up and leaky micro-vessels. I am now using it every night before bed and not only me but also my boyfriend who seems pleased with the effects of this eye roll-on too. Another plus with Lacura products is that are really cheap. The price for this one was a somewhere under £2. The consistency of this eye roll-on is a bit runny but this doesn’t bother me as the amount I use is quite small considering is just under my eye area. So overall I love this product and will definitely repurchase it!